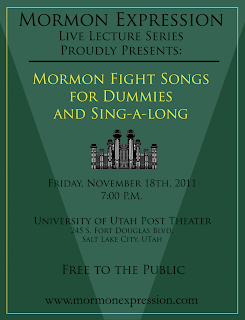 Friday night at 7:00 P.M., Mormon Expressions will be hosting Mormon Fight Songs for Dummies at the University of Utah Post Theater. I volunteered to direct the sing-a-long portion at the invitation from Zilpha Larsen. In the lead up to rehearsals, Zilpha mentioned that they would be singing 'The Cave' by Mumford and Sons. I took a listen, and realized I had no idea of the meaning of the lyrics. A few minutes research on Google and it soon pointed to Plato's Allegory of the Cave. I'd never heard of that either. So I read through the Wikipedia page on it, and then watch a sort of silly animation of it on You Tube. Friday Greg held rehearsal at his home. They were learning a new song titled 'The Cave' by The Mumford Sons. Greg was on electric guitar, Hans on banjo and bass, Monolo on drums and Emily on keyboards. As they were rehearsing, they let me audition to sing it. I haven't sung in quite a while, but I was pleased for the opportunity. it was pretty raw (for me anyways), but absolutely fun. Those guys were seriously moving through the music. It was great. So, I'll be conducting the Sing-a-long on Friday, plus trying out my vocals on Friday. I'm excited. The lyrics are quite expressive, unique, and therefore, have been somewhat difficult to memorize, but I think I've just about got it, memorizing it to and from work. If you're not too busy Friday, you ought to come and visit! See you there!